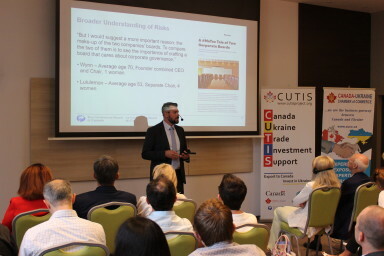 Jurvneshservice lawyer Kateryna Tsirat participated in an interesting for our society event organized by the Conference Board of Canada (Governance, Compliance and Risk), Canada-Ukraine Chamber of Commerce (CUCC) within the framework of Canada-Ukraine Trade and Investment Support Project (CUTIS). The event was hosted by Michael Bassett, the Associate Director, Governance, Compliance and Risk at The Conference Board of Canada, who presented statistics and outlined the issues of homogeny (as opposed to the declared diversity) – from the point of view of representatives of genders, cultures, etc. – of a board of directors of Canadian companies. Mr. Bassett focused on the “female” component of the diversity. In 2017, out of a total of 4 658 board members from the list of FP500 (the largest Canadian companies), 1 051 were women, that is 22, 56%, that, in the opinion of Mr. Bassett, is not enough. He emphasized that the main impetus to introduce diversity in boards of directors is not the one of observance of human rights, but the business one: doing business is more effective when a board of directors consists of people with different types of thinking and different approaches to problem solving. In this context, companies should introduce special tools to promote diversity, expand the scope of acquaintances of senior officials of the company between different age and gender groups because ultimately this is business in general that gets the advantages. The majority of participants of the event noted that Ukraine needs similar studies. To be fair such studies have been already conducted in Ukraine, for example, Women and Men in Leadership Positions in Ukraine within the framework of the UN Development Programme in Ukraine within the project “Strengthening SME Business Membership Organizations” implemented with financial support from the State Secretariat for Economic Affairs of Switzerland, in partnership with the League of Business and Professional Women of Ukraine and the Ukrainian Centre for Social Data. Jurvneshservice supports the principle of diversity in management, since women are faster in the process of decision-making, they can perform efficiently several tasks simultaneously, and they have more capabilities for foreign languages that totally make women very important for legal business.